Business, legal, and technical trends in architecture areconstantly changing. The Architect's Handbook of ProfessionalPractice has offered firms the latest guidance on those trendssince 1920. The Fifteenth Edition of The Architect's Handbook ofProfessional Practice includes access to a website thatcontains samples of all AIA Contract Documents (in PDF format forMac and PC computers). 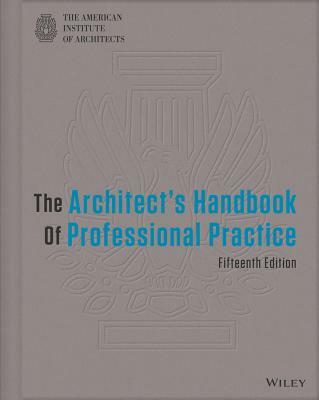 With comprehensive coverage of contemporarypractices in architecture, as well as the latest developments andtrends in the industry, The Architect's Handbook of ProfessionalPractice continues to be the essential reference for everyarchitect who must meet the challenges of today's marketplace withinsight and confidence. The American Institute of Architects (AIA) Since 1857, the AIA has represented the professional interests of America's architects. As AIA members, over 80,000 licensed architects, emerging professionals, and allied partners express their commitment to excellence in design and livability in our nation's buildings and communities. Members adhere to a code of ethics and professional conduct that assures the client, the public, and colleagues of an AIA-member architect's dedication to the highest standards in professional practice.